Uni-Ark Basic. 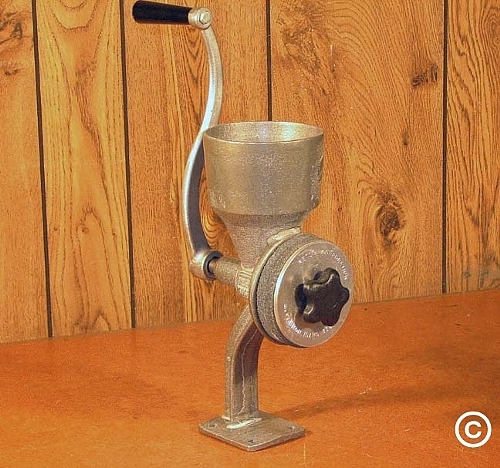 This beautifully designed hand grinder is identical to the white powdercoated unit except it comes in a polished aluminum version and with steel grinding wheels only. It is the economical RETSEL version of a hand grinder with a lifetime warranty and a very competitive wholesale price as well. This means that you are buying this machine at 40% discount. It can be easily retrofitted with stones, clamp and/or a flywheel, and a motorizing kit just like any other hand mills we manufacture here in U.S. If you buy this mill together with a flywheel, the manual handle will not be included. Most people that purchase this unit are mostly interested in keeping the mill for back up and/storage purposes. However, at a later time when they do decide to use it regularly, getting the accessories is always an viable option. Suggested retail price $245.95 We currently have over 200 of these units in our warehouse to be shipped out in moment's notice in case of national emergency, hurricanes, etc. Only stainless steel wheels will be automatically shipped with this machine. If you wish to buy ceramic stones for this mill, you need to purchase them separately. Free shipping on this item if paid with a check or money order or 8% discount may be applied if paid with check or money order. All our products are made in USA. Due to our strict quality control standards and supplier manufacturing deadlines our delivery time may vary depending on which color and item you select. The standard delivery time on all our products, repairs and special order items is 2 to 8 weeks at this time. Please call us at 208-254-3737 during our regular business hours before placing your order to find our current delivery schedule is at this time.